After validating your Filing in TariffShark and downloading the zipped XML file, have you ever wanted to submit the XML to FERC’s eTariff Sandbox for further validation? This blog article describes one method for doing so. 1. 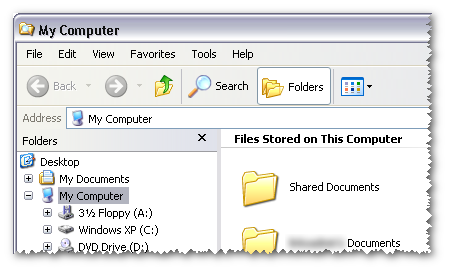 Open “My Computer” or “Windows Explorer”. 2. Type “ftp://etariff-ftp.ferc.gov” into the address bar (without the quotes) and press Enter. 3. You are connecting to the FERC Sandbox FTP site and will be prompted to login. 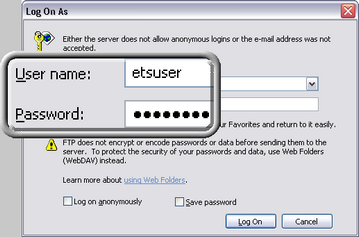 The user name and password to use are “etsuser” and “testxml#”, respectively, both without the quotes. 4. After successfully logging into the FERC Sandbox FTP site, your screen should look similar to the following. 5. Copy your zipped XML file (that you downloaded from TariffShark) and paste it into the folder named “ets_receive_files” (circled in the image above). 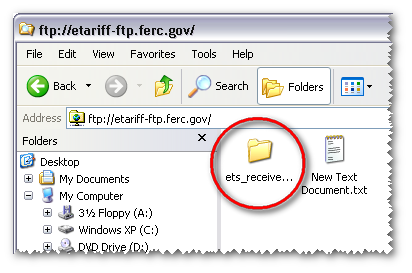 Once you’ve placed your file in the “ets_receive_files” folder, you may find that it has disappeared. This is normal. 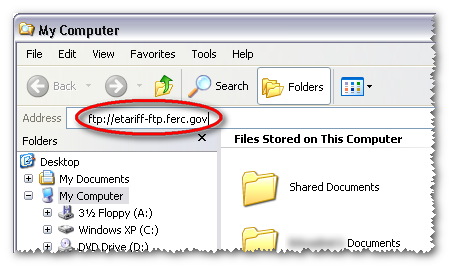 When FERC’s software detects that a new file has been uploaded, the file is moved to another location for processing. 6. That’s all there is to it. Now, just sit back and wait for an email to arrive from FERC with your validation results. The email will come from NoReply@ferc.gov and will have a subject line of “SandBox FERC ETariff Validation”. Submitting eTariff XML to FERC’s Sandbox is built right into TariffShark Hammerhead and takes just a couple of clicks. See it in action. If you have questions about using FERC’s eTariff Sandbox or if you use a different procedure for submitting your eTariff filings to the sandbox, we’d love to hear from you. Please comment below or contact TariffShark Support.